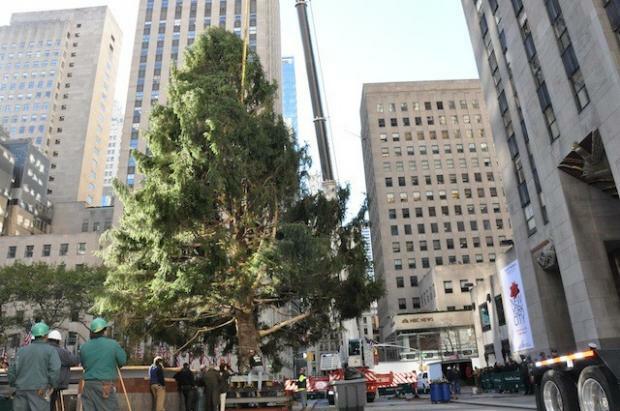 ROCKEFELLER PLAZA — A 74-foot tall Norway spruce rolled into Midtown before dawn Friday morning and was later erected as the 79th annual Rockefeller Christmas. The 75-year-old tall tree came from the upstate New York home of New York City firefighter Peter Acton, 38, who served as a first responder in the 9/11 terrorist attacks. It was on Sept. 11th of this year that the team scouting for the Rockefeller Center tree spotted the one in Acton's yard and approached him and his family about turning into one of the most famous trees in the country. Acton was at a 9/11 memorial service when his wife received a knock on the door and an inquiry about the tree. When his wife, Stephanie, called him to tell him the news, he was incredulous. "I really didn't think it was legit," Acton told DNAinfo at Rockefeller Center on Friday. "But when an official car pulled up my driveway two days later, I definitely realized it was legit." The tree, which was cut down from Acton's backyard in Mahopac, N.Y. on Thursday, made its way to Midtown on Friday morning and was driven onto the plaza right outside of the entrance to 30 Rockefeller Plaza about 7:30 a.m.
Acton and his family, including his two children Seamus, 11, and Fiona, 7, shared many memories under the massive spruce, and the kids were bittersweet to see it go. "I'm sad and happy that it's here," Seamus said. "But it's pretty cool that people can enjoy the tree that I've enjoyed so much for the last 11 years," he added. For Acton, it was a no-brainer to donate the tree to the people of New York as an act of gratitude for their support in the days after 9/11. "It means a lot to me that my tree is standing here in the heart of Manhattan right now," he said. "I look at it as a thank you to the citizens of New York who were so amazing all of us working in the rescue efforts at Ground Zero. There were so many everyday people who just opened their hearts to us and it meant a lot to me." Early morning onlookers in Rockefeller Plaza were impressed by the tree's enormity as it lay on its side on a flat bed truck. "It's huge!" said Leah Borgos, 27, who is visiting New York from Arizona. "I guess it always looks big when it's upright, but being so close to it when it's laying flat makes it seem even more massive." Others appreciated the trees roots, as it were. "I think it's nice that it came from an FDNY family," said June Zime, 48. "It makes it more meaningful." The tree will be lit in an annual ceremony on the evening of Nov. 30.